A new fence and a daily dose of harassment by college kids have reduced the number of double-crested cormorants nesting on all of East Sand Island in the Columbia River estuary. The fence was put up to see if it could be part of the Corps of Engineers' long-term strategy to reduce avian predation on ESA-listed salmon and steelhead smolts. Last year, cormorants, terns and pelicans were estimated to have consumed more than 27 million salmon and steelhead smolts, with cormorants taking more than 22 million. Researchers estimated that about 18 million of those young fish were sub-yearling fall chinook (nearly half from lower Columbia hatcheries), 3 million were young coho and the rest nearly equal parts yearling chinook and steelhead. The researchers figured the birds are responsible for the mortality of only a few percent of the wild upriver Columbia and Snake chinook and steelhead. Corps' spokeswoman Diana Fredlund told NW Fishletter that researchers don't have any numbers yet, but the "dissuasion" action seems to be working, and most of the cormorants are nesting west of the 8-foot-high fence designed to keep the birds out of 60 percent of the cormorants' previous nesting ground. By fencing off about four acres of the 17-acre site, the Corps wants to see if it can shrink the nesting ground even more than last year, when 13,000 nesting pairs of cormorants were counted on the island. By reducing available nesting areas, they hope the birds will actually leave the estuary for more hospitable habitats. Fredlund said researchers told her they don't expect overall cormorant numbers to be down much from last year, but are happy to see that the dissuasion effort and passive hazing seems to be working. The Corps' next step will be to actually try to get some cormorants to move to other nesting grounds--a move that Washington and Oregon wildlife officials aren't too happy about because the birds might concentrate on other salmon smolts along the coast. The Corps is already trying to entice terns to nest in southeast Oregon at Malheur Lake, where the birds could eat carp to their heart's content, Fredlund said. 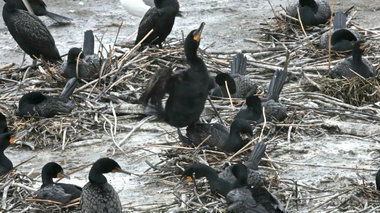 More than a hundred cormorants were radio-tagged this year, and most are still in the vicinity. Some were still nesting on the island after feeding as far away as the Lewis River. In early May, about 12,000 individual cormorants were estimated to be nesting on the west side of the fence, according to weekly updates posted on the Web. But a few weeks later, researchers gave up trying to estimate this year's numbers--"given the size and distribution of birds on the island; most cormorants on the main colony are in late incubation, but nest initiation continues in some satellite colonies and in scattered areas throughout the main colony; most of the oldest nests have four or five eggs, but areas that initiated later, around the west blind, have mostly three egg nests." Researchers had previously estimated predation rates by cormorants on lower Columbia hatchery fall chinook at 47 percent and 26 percent for lower Columbia hatchery coho, while upper Columbia springers showed only a 3.6 percent loss, and 7.1 percent for upper Columbia steelhead. Predation rates by the estuary cormorants (based on data from 2007-2010) on Snake River steelhead were pegged at 13 percent, and much lower than that for Snake River chinook--only 5.1 percent for springers, 3.7 percent for falls, and 4.8 percent for Snake River sockeye. More than 3,200 brown pelicans have also been counted on East Sand Island this year, along with more than 10,000 Caspian terns, down from 14,000 last year. Harassment and predation by several bald eagles last year resulted in a total breeding collapse for the terns, who would leave their nests after the eagles swooped in, going after individual terns. Opportunistic gulls would then swoop in to take eggs before the terns returned to their nests. By the week of May 28, researchers reported up to 19 eagles observed at the double-crested cormorant colony and widespread colony failure, "accounting for about 25 percent of the season's total nest failures to date: from Monday through Wednesday (5/28-5/30) groups of up to eight eagles, adults and sub-adults, were observed walking through the colony eating cormorant eggs and occasionally adult cormorants; gulls and ravens followed the eagles, taking eggs and adding to the nest failure; cormorant chicks began hatching in earnest around the observation tower on Wednesday and Thursday (5/30 and 5/31); most of the remaining colony is in late incubation, with some late nest initiation continuing on the west jetty." The Corps had decided to continue the harassment if more than 7,000 nests were counted on the island by June 1. An aerial photo confirmed this, so the dissuasion actions will continue through the end of June.